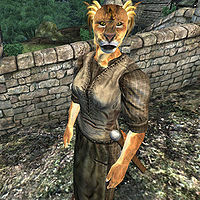 Zabhila is a Khajiit scout residing in the village of Border Watch, where she shares a house with the town shaman, Ri'Bassa. Zabhila believes in the ancient prophecy of Ri'Bassa's great-great grandfather, K'sharra, who foretold that three signs would hit Border Watch on the day the world ended. She also believes that the gods are protecting the town, and therefore lives in peace and harmony, at least for the moment. She gets up early every day at 4am, then wanders around town all day long, talking with the other residents. At 7pm, she will eat dinner for two hours at the popular Border Watch Inn, run by fellow Khajiit and avid cheese collector S'thasa. At 10pm she returns home to enjoy a night's sleep. The only exception to this schedule is when the prophecy suddenly becomes reality, at which point she will receive an energy boost and will be found running around town in wild panic. Once the related quest is completed, she will return to her normal schedule, while always keeping a wary eye on the sky. She wears lower-class attire consisting of a coarse linen shirt and linens and a pair of oiled linen shoes. In combat, she relies on a leveled one-handed blade of the best possible quality. Her only other possession are a few gold coins. Like the other Khajiits in town, she's not very talkative, but once you have started the related quest, she will point you towards Ri'Bassa. Whether she gets any sleep during the night depends on who gets to the bed first, her or Ri'Bassa, as a table is blocking one of the sides of the double bed. Esta página foi modificada pela última vez à(s) 06h43min de 8 de agosto de 2013.